Today I was looking through some fonts for a project and came across some familiar ones. Just for a giggle I wondered what they would look like if things had worked out a little different. 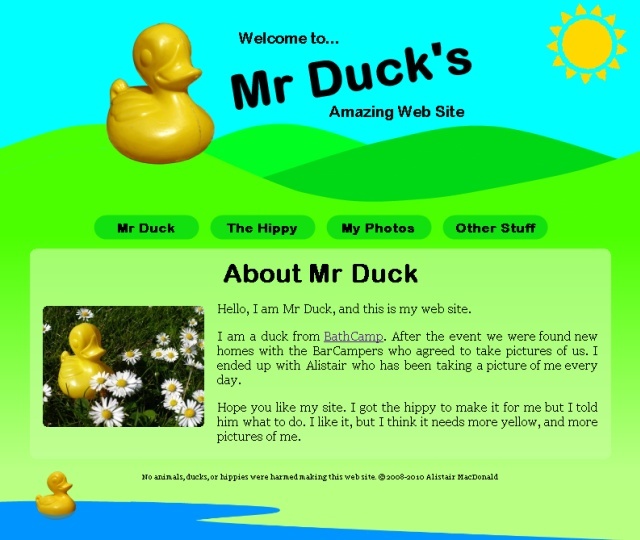 So, at long last Mr Duck has his web site. 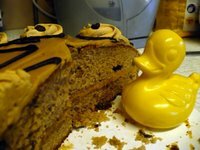 I have been taking pictures for Duck 365 for the last year, and stupidly have agreed to continue by popular demand. What I never quite got round to was making a web site for it. Eventually I managed to find some time by using the good old excuse of it being a learning exercise. 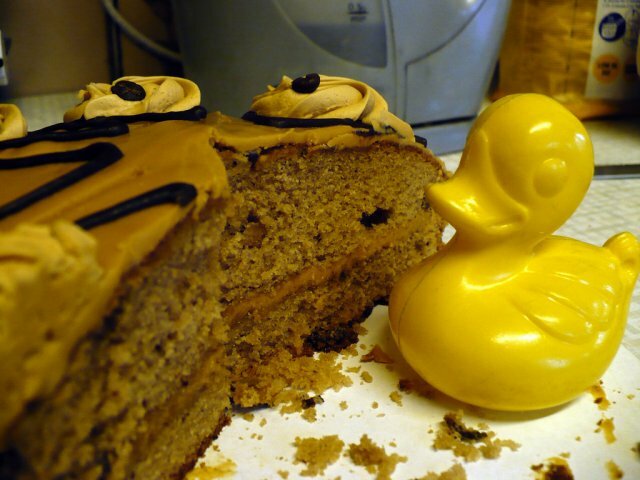 The site is a little tong in cheek fitting in with the Mr Duck back story. It is the web site that a small yellow plastic duck would have asked for. :-) It has a lot of new CSS layout in it that I have used as an experiment, but it does degrade gracefully. The thing that most amazed me is that the CSS font-face actually works, although there are bugs that I needed to work around. Also I accidentally I created a new simple templating system using an error document to catch the requests and build the web page. 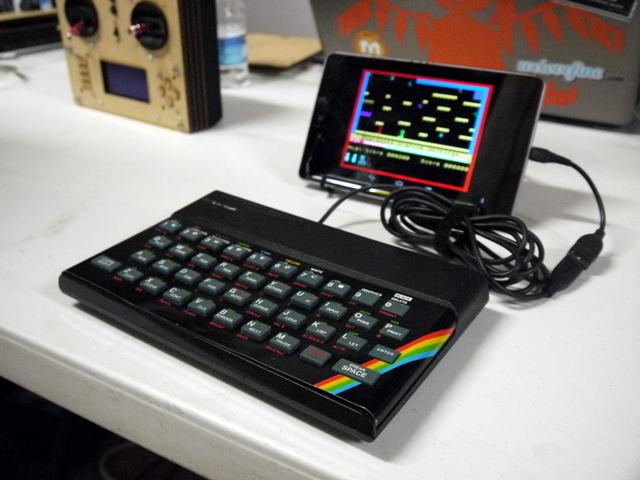 I shall probably build on this for other projects. I have also found a new way to work on IE computability. It appears that IE6 and IE7 have very close layout problems. The markup for IE6 also fixes the problems for IE7. So what I have done is built the site using Chrome and Firefox, and then fixed the layout in IE6 for IE7 and below in a separate conditional CSS file. Then all I needed to do was work around the PNG transparency issues for IE6 and below in a second conditional CSS file. Everything else just works then, and I only needed one version of IE installed for development. The best thing about the site from my point of view is that it should be zero maintenance. It automatically pulls the pictures from flickr and even uses flicker to manage the comments. I decided not to display the comments on the site at the tims as there a security implications of allowing users to add content to your site, but I do display a comment count and link back to flickr. I even dynamically generate the site map and RSS feed. There are a few more things I would like to do. I plan to add some slow cloud animation, improve navigation, and intermittently add a few more random Mr Duck images to the background. For now though I will leave it or I will just not get anything else done. 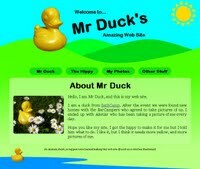 So please check out “Mr Duck’s Amazing Web Site”, and you can also follow his antics on Twitter. Also please let me know if it works well or not on your browser and if there is anything else you would like to see. 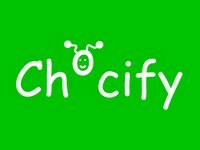 Last month I came up with the idea of Chocify, a tong in cheek web service taking the community aspect of Spotify and applying it to chocolate. In another of my fits of madness I decided I could come up with an idea every day and put it on the Internet like an advent calender. Naturally I did not tell anyone because at the time I did not know if I could keep it up or if it would be any good. I also wanted to get a bit of design work done for it. As it turns out it’s completely rubbish, but I am still going so you might want to have a read anyway. You can follow these winning ideas on the blog, or on Twitter. Naturally I never got round to designing anything. 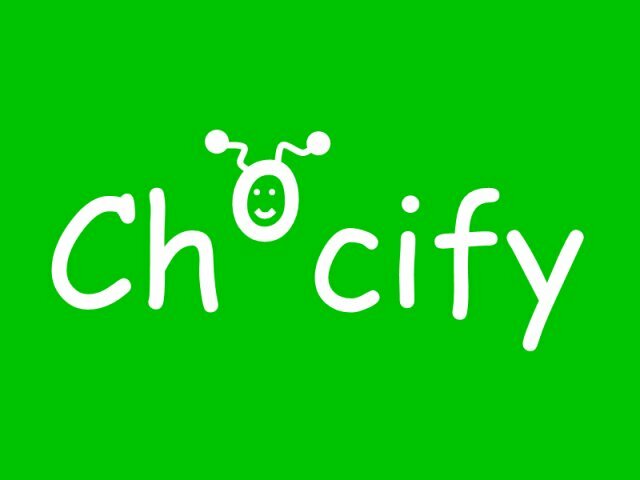 Today I came up with a cracking idea for a web service called “Chocify”. People have been using Spotify to jointly build up playlists for the day, the season, or events. Why can this not be extended to chocolate? For example I like the idea of starting off with a KitKat Chunky, followed by a slightly more sticky Twix, and throw caushion and commen sence to the wind and top those off with a Double Decker. Now, someone could see my mistake, that being the lack of a Crunchie bar, and insert it in to the eat list for me. I can also share this list with anyone I am visiting who needs to get supplies, or anyone who shares my taste in chocolate. I know what you are thinking, but there is a revenue stream here. Yes people can take the lists and head down the sweet shop, but just imaging the convenience of a “buy it now” button, and within two or three months the postman (or woman, we don’t want to be sexist at Chocify) will deliver them to your door. The domain name is still available but won’t be for long with such a great idea. It’s a winner. Anyone want to invest? 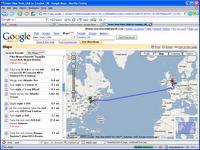 Have you used Google Maps to travel across continents? 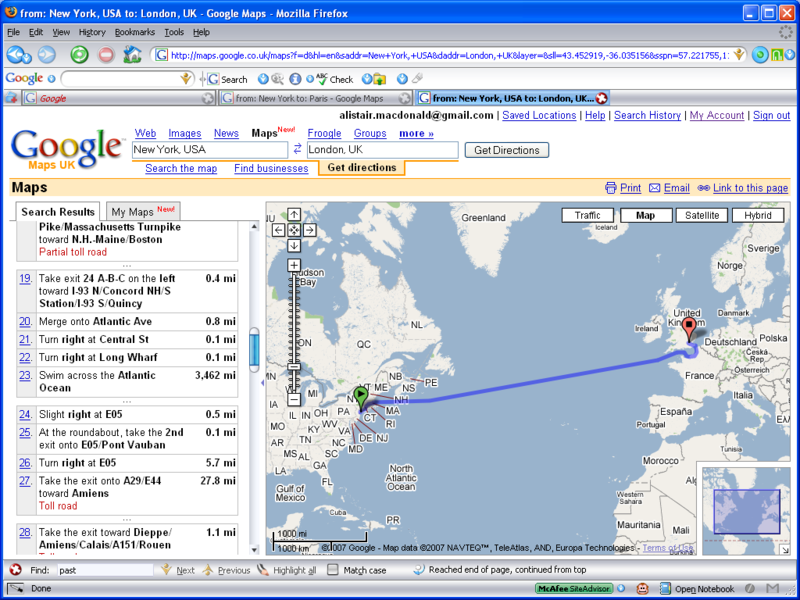 Someone suggested I have a go at planning a trip from New York to London. It worked well, although 3,462 mile swim across the Atlantic ocean in instruction 37 may take most of the predicted 29 days and 10 hours journey. You can check this on Google Maps if you don’t believe me.